Hey guys, it's nearly 2015. Shocking- I know, I honestly don't know where 2014 has gone. 365 uncounted days but anyway let's get straight into the looks. 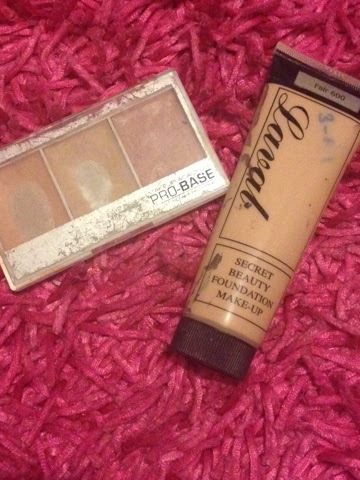 *Applied my foundation (Laval Secret Beauty in Fair.). With the MUA Pro Base Conceal and Brighten Kit I used the skin tone shade to conceal any breakout, I find cream concealer lasts longer so will survive the night. Then I used the more peachy toned concealer to counteract the purplish pigmentation under my eyes, this does the trick but usually tends to crease so I use this lightly but overall I do get brilliant coverage from these products. *After letting it settle into my skin I set it with Miss Sporty So Clear pressed powder in Translucent. I swear by this powder. It reduces the redness of breakouts and leaves your face looking smooth. But this is the type of powder that may make you look cakey if you are abit heavy handed. 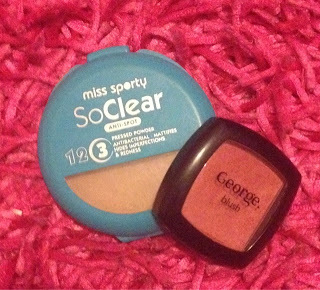 I then applied George's (from ASDA) blusher in Little Gem. This has gold specks running through it so leaves you with a glowing finish and the shade of pink is gorgeous. 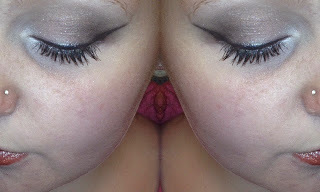 1 # I used the white shade in my inner corner and blended towards the lid. 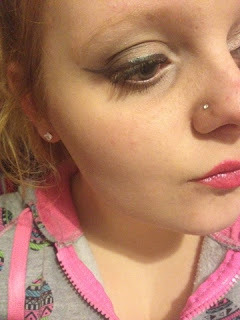 2 # Then I put the pink shade all over my lid, very messily but an even colour was applied. 3 # On the outer third of my eye I applied the coppery brown shade and blended it in with the pink. 4 # Then with the 'dreaded' foam applicators given with the palette; I used the tip of one to get a very thin line of the gray shade and blended it out with my angled eyeshadow brush. 5 # The palette came with a gel type of eyeliner with silver specks of glitter. So with the eyeliner brush (provided) I made a thin line following my lash-line and flicked it out very thinly. To be honest it wasn't the most pigmented but when I dabbed the gray shadow over the top it stood out more. 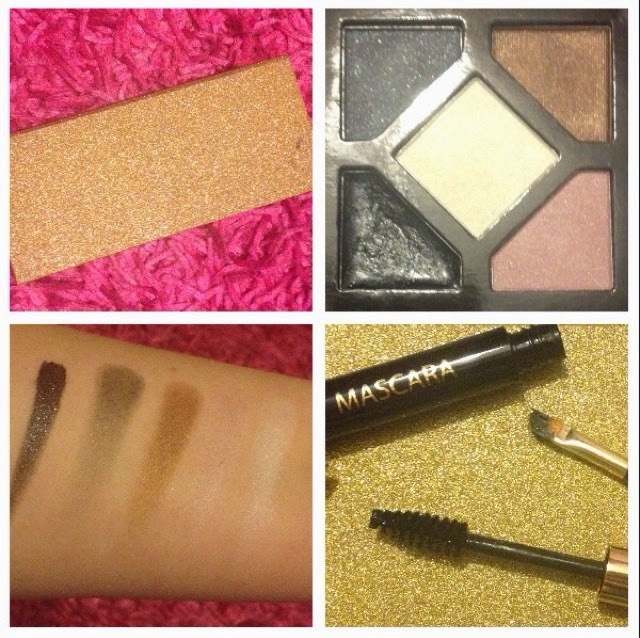 6 # I also added abit of the mascara that was provided and to my shock it was actually quite amazing! 7 # I then added some silver glitter because the makeup looked abit dull. That was it for my first look. 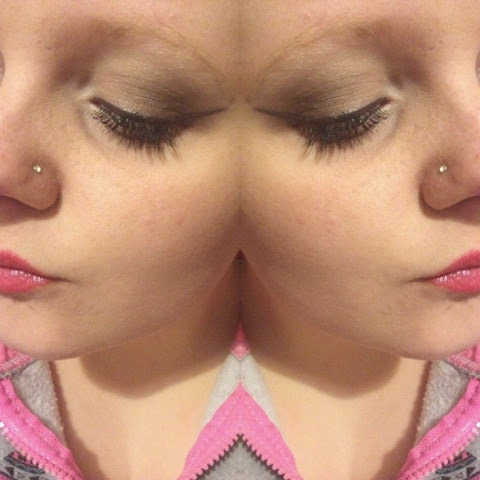 A simple smokey eye using my new palette. I am pretty impressed with the pigmentation and the consistency of the eyeshadows. The mascara is incredible and so is the eyeliner brush. I think if the eyeliner was a tad bit more pigmented it would be a 10/10 from me!